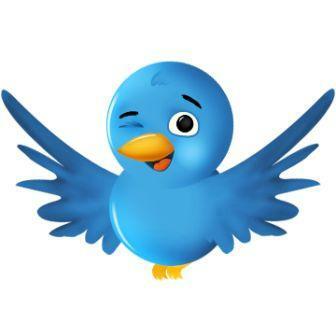 This is part 2 of my beginner's guide to Twitter for small business owners and employees. If you missed part 1 be sure to get caught up here. Part 1 was more focused on the fundamentals of using Twitter, and in this post I'll give some guidelines for growing your follower count and monitoring your brand so that you can interact with current and prospect customers. All set? Here we go! I mentioned this at the end of the last post, but I want to say it again: make sure you follow people relevant to your industry or field. If you have a favorite magazine, website or publication be sure to seek them out on Twitter. There are a couple of reasons this is important. First of all, you'll learn lots of new information that you can apply to your own product, and secondly you'll be associated with industry leaders in Twitter's recommendation engine. If you're not sure who to follow Twitter provides recommendations based on Twitter users that post similar content to you and the people you follow. 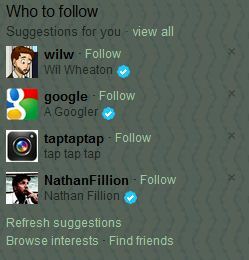 Take a look at the right side of your Twitter profile to see the recommendations. You can also narrow by interest, which makes finding interesting people even easier. The reason this is important is that your prospect customers can do the same exact thing, so if they're following some of the bigger players in your industry and you're doing a good job of interacting with those people, you'll be shown among those users as recommendations. This is the tough part, and a lot of it depends on the social dynamic of your small business. One thing its important to keep in mind when posting information to Twitter (and with any social network for that matter) is that people's BS radars are typically accurate, and it's fairly rare that someone enjoys being marketed to. One of the quickest ways to lose followers and influence on a social network is by filling your social stream with advertisements. On the other hand, people love great deals and useful information. If you post information to a blog, a great way t0 get started on twitter is by sharing your posts with your followers as long as they contain useful information and aren't advertising-focused. Additionally, if you're running a promotion for 15% off of the widget that your small business sells, share that too! In fact, one great way to see the benefit of Twitter is to run a promotion specifically for it - tweet out a free shipping code for example. The important question to keep in mind when sending out a tweet is if someone in a different business sent that tweet to you, would you find it useful or annoying? If it's useful, go ahead and send it out. If it's annoying, don't. It's a pretty simple concept. Finally, remember that you aren't limited to tweeting about your small business, its field or its products and services. A great way to connect with people on a personal level is by posting the happenings around the office or work site. Are employees or coworkers gathering to celebrate a birthday or holiday? Tweet about how great the cake or food was! Are you on a company trip? Let everyone know where you're headed! These tweets will build a connection between you and your community, and in many cases they're some of the most engaging. So you've followed a bunch of folks, started interacting with people in your industry, and even engaged with current and prospect customers by tweeting about the company picnic. Now you need to cut through some of the general tweets and focus more on monitoring your brand or industry. One great way to follow the latest news from a certain topic is by setting up Twitter searches. Featured at the top of all Twitter pages is the search bar. Simply insert a topic into the search bar and all of the recent tweets containing that term will be loaded onto the page. You can even save searches in order to monitor them over time using the button shown below. Be sure to @reply folks that post interesting information and make note of any hashtags they're using. By saving searches on hashtags (#smallbusiness for example) you'll be able to target your searches even more directly. This is because while a search on the keywords "small business" may return irrelevant tweets that simply contain those words, a search on the hashtag "#smallbusiness" will return tweets whose original intention was to be relevant to small businesses. Note, you may have to experiment with different hashtags that pertain to your industry before you find some of the best to key into. Also remember to use those hashtags yourself moving forward! After all, if you're monitoring the hashtag via a search there's a good chance that other people are as well. At this point you should have a great handle on how to use Twitter to grow your small business's brand online. You've followed, tweeted, @replied and searched. In the final post in this series I'm going to share some free tools that will make using Twitter even easier. Be sure to check back later in the week for that post, and please message @protocol80 on Twitter if you've found this guide useful.